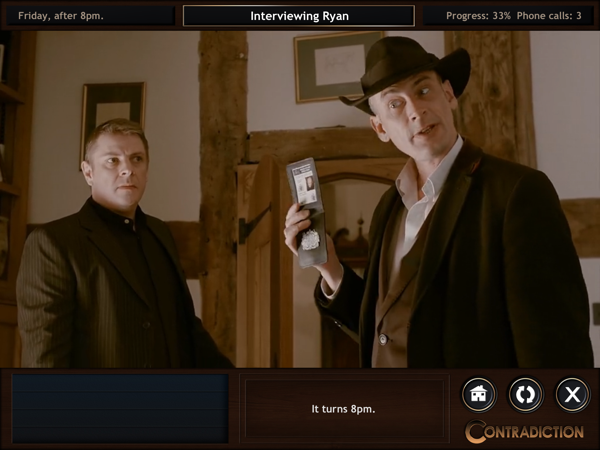 Contradiction, by Tim Follin, is a very unique sort of murder mystery game. The entire game is made up of video footage, so it feels like you’re playing a part in a movie. I admit, I was a bit skeptical about it, as the idea sounds like it could be incredibly cheesy and come off seeming amateurish if not taken seriously. Basically, I had my doubts that something such as this could be pulled off well. But I was actually blown away by how polished the game turned out. First of all, the acting is terrific and not the slightest bit cheesy. There is humor in the game, but it’s never over-the-top and always fits the characters. I could have easily watched this on TV, but instead I was playing a part in it, which made it much more enjoyable. There wasn’t a weak character or actor in the entire game. There were also very few cliches and the story kept me guessing until the very last moment. Perhaps others would have figured everything out sooner, but I was completely surprised by the ending. You take on the part of Detective Inspector Frederick Jenks, visiting a little place called Edenton to investigate the drowning of a young woman named Kate Vine just outside the village. You start your investigation at 5PM on a Friday evening a week after her death. Your job is to look around for evidence and get as much information from the locals as you can. She was a student who attended an odd business course that uses untraditional techniques, so there are a lot of strange things to uncover. 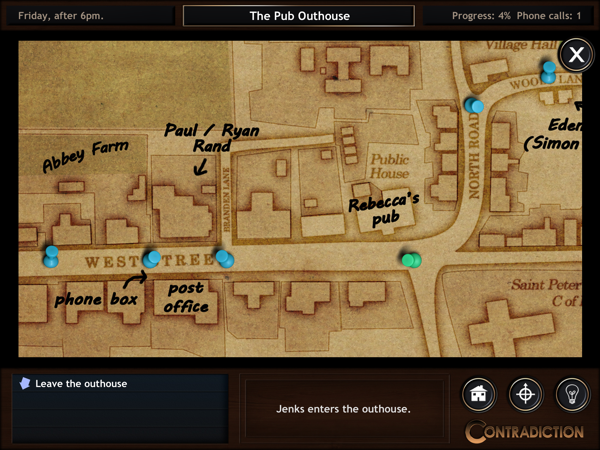 You can walk through the village via arrows on-screen, as well as take shortcuts using the map. Transitions between screens are quick, so even though you do a lot of backtracking from one end of the map to the other, it’s relatively pain-free. On my iPad Air 2, everything ran as smooth as butter. I encountered absolutely zero lag, which made exploration a pleasure rather than a chore. The detective is a likable character who’s good at getting information from people. Still, these characters might talk but don’t always tell the truth. That’s where the game’s title comes in, and the real meat of the game. You have to find contradictions in what they say so you can catch them in a lie. Once they know you’re onto them, they’ll reluctantly divulge more information. But, they might also lie some more. Luckily, everything important that they say is recorded in a sort of bullet list so you can review them at your leisure, looking for those contradictions. When you catch a few lies and learn more about these people, the night will progress, an hour at a time until you hit midnight. Jenks mostly plays by the book but has no problem snooping around if he, say, finds a key just lying around on the ground. 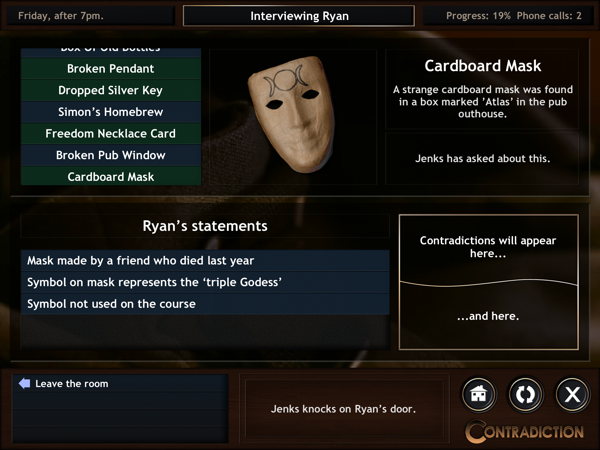 So besides asking questions, you need to keep an eye out for clues and interactive items. 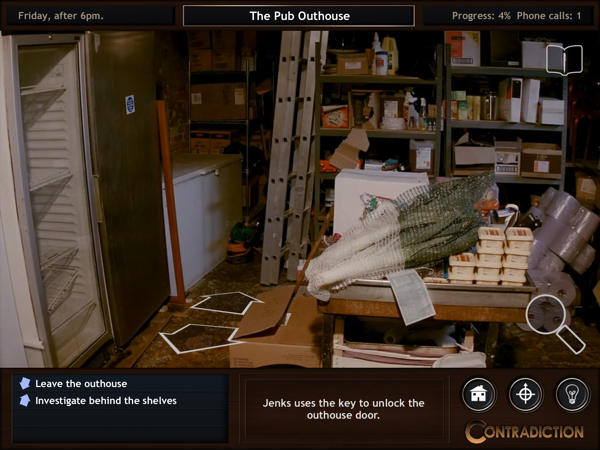 Unlike traditional point-and-click adventures where you’d have to look carefully for objects, in this game you mostly just need to notice the magnifying glass icon when it shows up in the corner. This means that there is something interesting in the area and Jenks will pick it up. Sometimes this icon will only show up after something else in the game triggers it. So you do need to keep revisiting the same locations to see if anything new is happening. There are also some moments where you need to use an item from your inventory, like a screwdriver or flashlight, and the game doesn’t hold your hand through these. There were a few really tricky parts in the game where I got stuck. The game provides a hint button to lightly nudge you in the right direction, but sometimes it just tells you that someone is lying. When you have five or six characters who could be lying about anything they’ve said, it can be a bit overwhelming. To aid with this, there is also the option to call the police chief after you’ve made a certain amount of progress. He might help lead you in the right direction, or he might just tell you what you already know. But if you’re really stumped, it’s worth a shot. 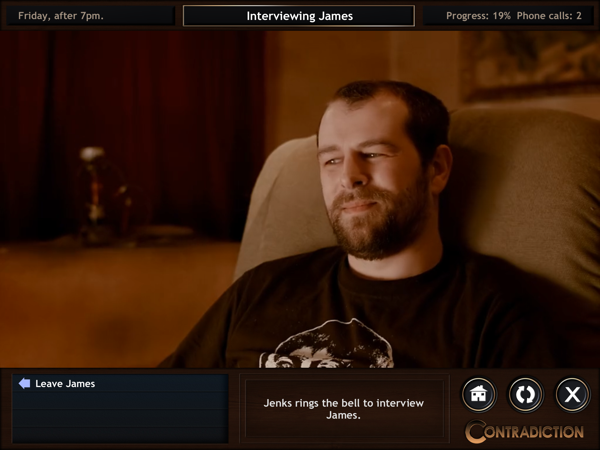 And finally, if you absolutely cannot figure out who’s lying, the developer gives the answers on his website, based on the percentage of the game you’ve completed. (Update: He no longer does, but I made a walkthrough myself. )I admit, I did use it a few times when I got impatient, but I don’t feel it detracted from the experience. I’m sure some players will be able to catch the lies better than I did. But even if you can’t figure anything out on your own, I think the game would still be very enjoyable. This is because of the strong characters and story. 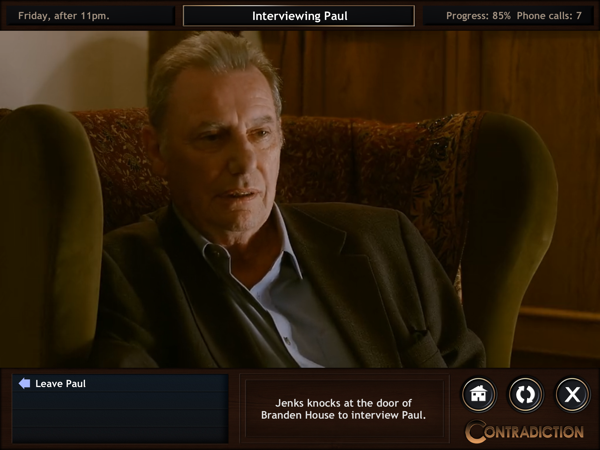 If you’re already playing the game and need help, try my Contradiction walkthrough. You might also like Her Story by Sam Barlow. Great review. Glad you enjoyed it. I thought you might. I usually like anything that’s a little different. This was definitely different & a ton of fun! Yep, good call. 🙂 Glad I finally got an iPad! Next I’m playing Broken Age. The second part is coming out this month. 🙂 Catching up on all the iPad games I couldn’t play before! I still can’t belive you did all that on an iPhone up until now. Very impressive. It’s been a while since I played so I don’t remember the details. Are you sure the website doesn’t have the clues anymore? The website with hints is gone and I’m stuck at 96% complete with no helpful hints from the chief or the enigmatic comment from the hint button. I might not even remember all the contradictions. Let me think about it. Are others looking for a walkthrough, too? It would be time-consuming, so would like to get an idea how many people are looking for one. if you like these kind of lines for Paul Darrow, you should most certainly look up the “Blake´s 7” television series from the BBC (1979/1981) in his role as Kerr Avon!